The station 107.7 KCDZ signed on in Joshua Tree, CA in 1989. It's a Class B 6,700 watt station to the East of LA but with a directional signal transmitting North into the Mojave desert. The Los Angeles Times reported on this aptly in their "Desert Cities Scene" section. "The Federal Communications Commission has assigned the call sign KCDZ to the new FM radio station license recently awarded to Morongo Basin Broadcasting Corp. "We wanted call signs that would be easy to remember that let people know what we are doing," said Gary Daigneault, program director and vice president for the locally owned corporation... The studios are currently under construction in the Starr Plaza in Joshua Tree. KCDZ-FM will broadcast 24 hours a day at the assigned frequency of 107.7, and its signal is expected to reach from Amboy on the east to Yucca Valley on the west. The projected air debut is set for July. The American South West is full of stations broadcasting in the desert. What distinguishes this one is content. They brand themselves as a Community station even though they are formatted Hot AC. So they're not in the same league as say, KXCI. 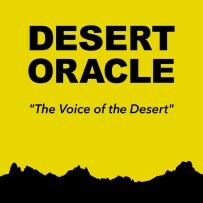 But despite that, or perhaps to compensate for that, they are also the radio home of Desert Oracle Radio which airs Friday nights at 10:00 PM. More here. Ken Layne, “the voice of the desert” hosts the program. Though he's probably best known for his accomplishments as a writer and/or blogger for Gawker, Wonkette and The Awl, he also is a writer and novelist and editor of the literary journal Desert Oracle. It is that publication that begat the radio show and podcast of the same name. The print version of Desert Oracle only launched in 2015 giving it a small head start on the program which debuted June 18th, 2017. He described the first program "Expect evocative tales of lost mines, UFOs, missing tourists, secret military projects, local legends, weird animals and weirder people." The summary made it sound like a take on an old Coast to Coast AM episode. "It's a wonderful set up out here tonight. because I'm broadcasting form this old yellow trailer there are all kinds of people walking around in the night between the main house and the various sculptures in the trail and there's a shipping container across the way people are in there singing various songs and what have you. There are big creosote and Joshua trees around and we've got radios piled up all over, every kind of portable radio, in various states of repair outside the trailer here and around the property... A night out on the desert way down a dirt road. People are parked up and down the road, maybe just arriving, maybe just leaving, maybe headed to the liquor store..."
Ken was describing a remote broadcast from an art show but somehow his chops as a former tabloid writer, his baritone voice, and the soundtrack make for a somewhat spookier production. He manages to add gravitas in places you wouldn't expect, like an interview on energy independence. The program seems out of place on KCDZ, more like a program from an actual community station. But it also is perfectly at home in Twentynine Palms, broadcasting from a trailer, in the darkness, surrounded by the ghostly night landscape of the Mojave.